This year's birthday was very low key, and lovely! 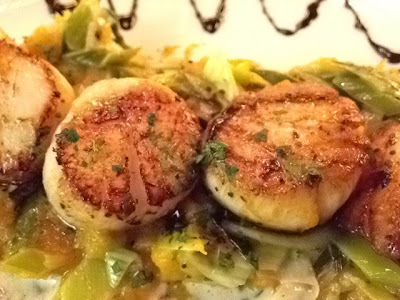 I stayed in Long Island with ABF, and we went to a place near his home, Apertif. My friend CJ had a very nice first date there and spoke well of it, and I do love all zings Fraynch! 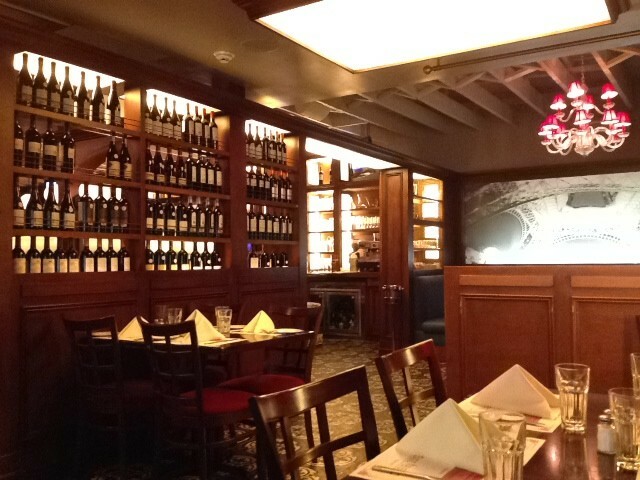 The decor was a favorite of mine--dark wood, rich red (without being brothel-y), images of Paris all over the place. Lovely! They have an impressively interesting and delightfully affordable wine list. ABF ordered their house Merlot, which was delicious. I went with the Old World flight, which had reds from Spain (Garnacha grape), France (Grenache/Syrah blend) and Italy (Sangiovese/Cabernet/Merlot blend). These were a little... chewy..? for me...on their own. Got much more delicious with the food, but next time I think I'd start with a glass of a house red. 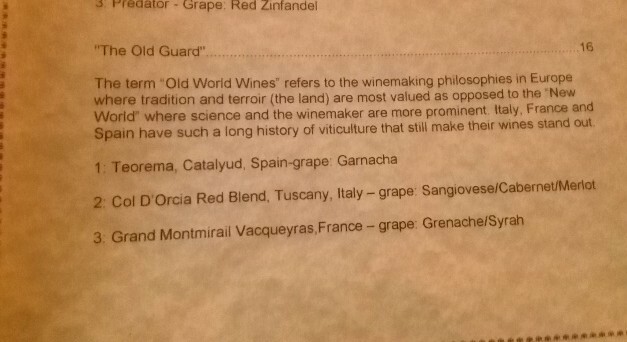 I'm no wine aficionado--I think I was out of my league with this flight--but it was still fun to try different types. I'd heard great things about the roasted beet salad. Those things were true. 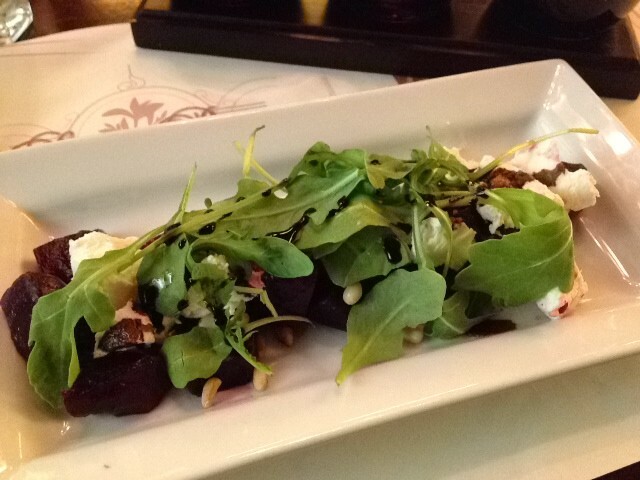 Succulent beets, tangy, soft goat cheese, and pine nuts for a little crunch amidst the arugula. Sensational. 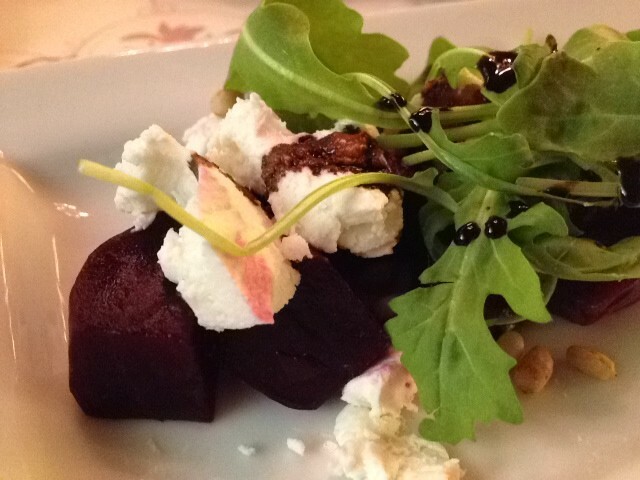 A drizzle of rich, 25-year aged balsamic vinegar was the perfect finish. Shame on me for never making this at home! 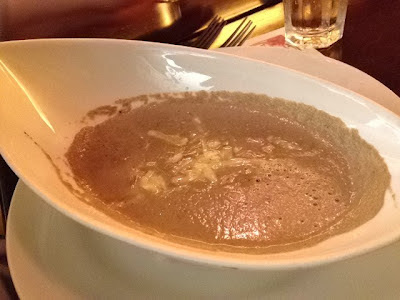 ABF started with their special soup that day-- cream of wild mushroom, sprinkled with some shredded Gruyere cheese. This was impressive, even to me, She Who Fears Fungi! 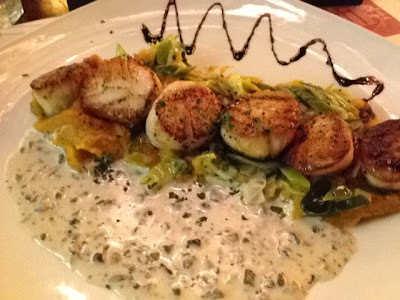 My entrée: Fricasseed scallops over a butternut squash purée with leeks. I'm not a huge leeks fan, but the scallops were out of this world delicious...so perfectly cooked, a little savory crust on the outside. The cream sauce with the touch of truffle? NOMANOMNOM! So outrageously wonderful. Happy Birthday to my MOUTH! ABF's dish: Poulet Farci (Persian Chicken)-- chicken breast stuffed with spinach and cheese, set nicely on a sauce infused with Chardonnay and dates. This chicken was shut your mouth good. 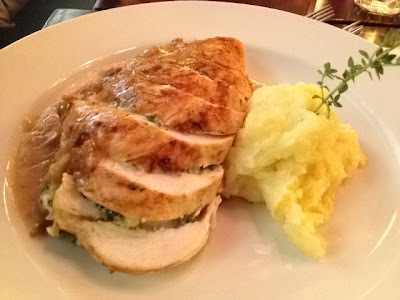 The mashed potatoes were just okay, but the chicken was supremely delicious and juicy. There was a coffee creme brulée I really wanted to try for dessert, but we were both surprisingly stuffed--and happily so. 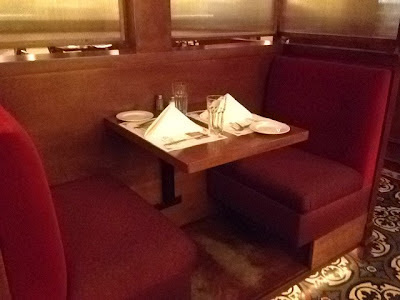 Perhaps next time-- and I think we'll snag one of those cute small booths in the bar area. 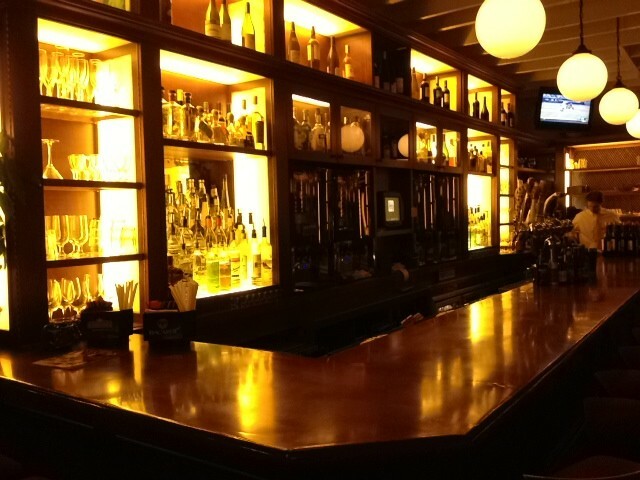 Excellent service, a wine list that wows, and fabulous food--let's go this weekend, ABF!